You can earn up to 27,500 American Airlines AAdvantage bonus miles when you buy or gift miles before Aug 5, 2015. Note: Transactions are nonrefundable and nonreversible. Another promotion from Visa Checkout. This one is for Canadian residents only. From now through Aug 18, 2015, you can get $20 off when you spend $70 or more at Staples.ca using Visa Checkout. The discount will be automatically applied upon checkout. Note: this promotion is not valid on any Bose products, downloadable software, services, business service provider or custom-printing service provider Web sites, gift cards, dining/activities/getaway packages, phone cards, postage stamps, purchases for Canada Post postage or prior purchases. Limit one discount per person. No cash/credit back. May not be combined with any other coupon, discount or offer. Two-day seat sale on WestJet flights to destinations in Canada, US, Mexico and the Carribbean. You need to book by July 29, 2015, and travel from September 9 to December 10, 2015 (blackout dates: Oct 8 - 13). Please see more details from WestJet website. And as always, this offer is limited and subject to availability. You need to act fast. Canadian North is offering 2X Aurora Rewards points if you book with Canadian North and travel by September 30, 2015. And, you'll also earn Aeroplan Miles when you book with Canadian North in addition to Aurora Rewards points. You need to ensure your Aeroplan number has been added to your Aurora Rewards account. 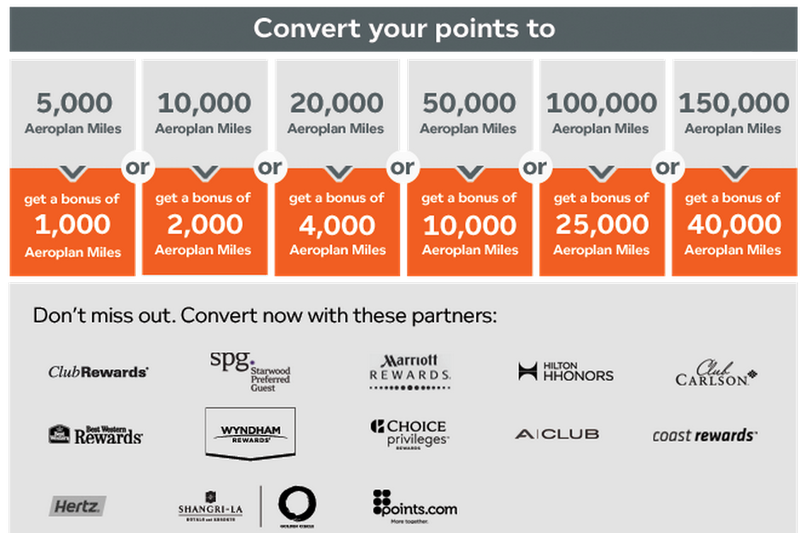 Aeroplan announced a promotion for people converting partner loyalty program points (hotel, car rental, and points.com) to Aeroplan for bonus. Last time we saw this type of promotion is in Apr 2015. So, Aeroplan may have another similar offer at end of 2015. For this time, maximum 40,000 Bonus Aeroplan Miles can be earned per Aeroplan Member before Aug 25. 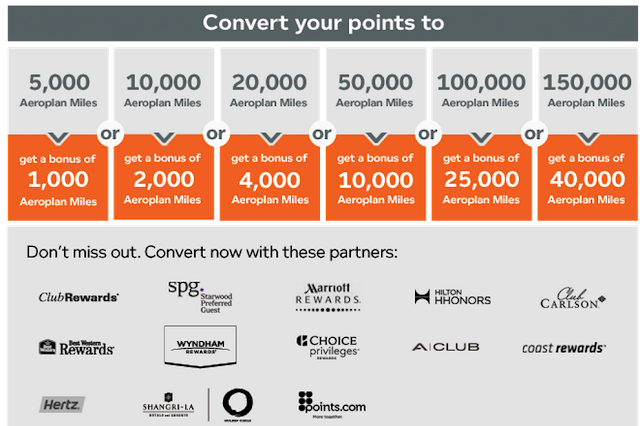 For example, if you have 120,000 SPG points, you can convert them into 190,000 Aeroplan miles. Unfortunately, AmEx MR points and CIBC Aventura points are still not eligible for this promotion. When you reserve and pick-up BestBuy.ca online order placed on July 27 to July 28 (order value > $100), you can get a $10 BestBuy savings certificate. Limit 1 certificate per customer. This savings certificate will be emailed to you within 10 business days. So, you can use it for next purchase. You need to input your Mileage Plan Number online to check if you are qualified for this offer. 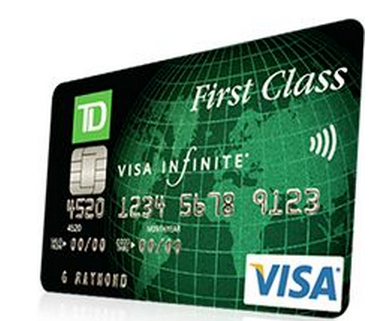 With the TD First Class Travel Visa Infinite Card, you'll receive a Welcome Bonus of 20,000 TD Points ($100 value). If you spend $1000 on your card within the first 90 days, you can get an additional 45,000 TD Points, ($225 value). So, totally you can get travel value of up to $325. This is the highest welcome bonus I have ever seen for this credit card. Although the TD Points will be devalued after Aug 16, this is still a pretty good offer (especially if you have the TD All-inclusive account). Note: You must apply by August 31, 2015 to be eligible for this offer. On Aug 3, ZenBanx customers can exchange CAD for USD at par with no transaction fees for a single transaction up to $250. Under current 1 USD=1.3 CAD rate, if means ZenBanx give you $75 CAD for free. ZenBanx did this before on Jul 1, and may continue do this in the future. You can earn 650 Aeroplan Miles on select Kirkland Signature grocery products at Costco (Ontario, Quebec and Atlantic Canada only) before Aug 18, 2015. This offer is targeted. So please check your email for this offer. You can see those Kirkland grocery products from this link above. Until August 9, when you redeem 95 Miles from your AIR MILES Cash balance for $10 off any purchase at Shell (excluding tobacco products), you can receive 25 AIR MILES Bonus Miles. It equals 26.3% less Air Miles on redemption. No coupon required. 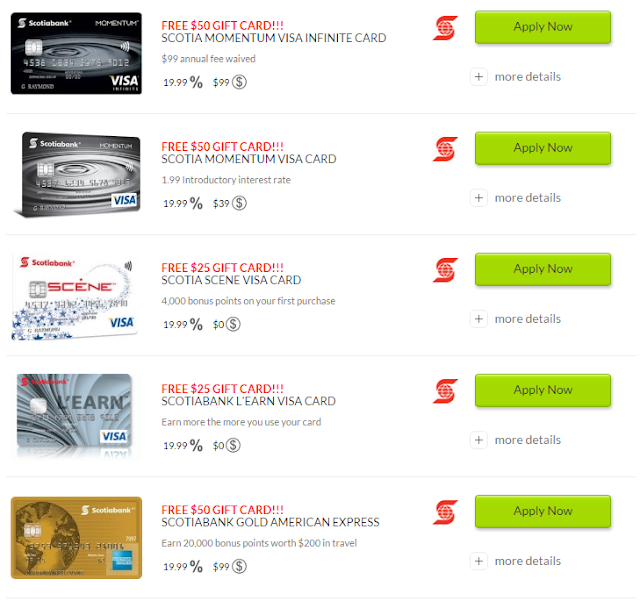 Until Aug 31, 2015, WalletSavvy.com is offering gift card (up to $50) on some Scotiabank credit cards. You can choose the gift card type that you want from Amazon.ca, Starbucks and Winners. Please go to their website to see the details. A good promotion from SPG. If you stay three or more times at Four Points, Aloft or Element hotels, you can earn a $50 prepaid MasterCard before Nov 30, 2015. Online registration is needed. This is a really good offer if you have travel plan before December. Petro-Points and iTravel2000 now have a new Petro-Points members only travel website: itravel2000-petropoints.com. As a Petro-Points member, you can get exclusive discounts on flights, hotels, vacation packages, cruises and car rentals etc. You can earn 10 Petro-Points for every $1 spend on travel purchases, and then redeem those points for those purchase (10,000 Petro-Points = $10; so 10 points = 1 cent). Before Jul 24, you can get 1000 Petro-Points just for logging into this website. This offer is for first 100,000 Petro-Points members. If you are not a Petro-Points member now, you can register online and get an extra 2,500 Petro-Points. Before Jul 18, when you shop in‑store or online at Home Hardware, you'll earn 2X Aeroplan miles on your purchase. It is a good time to start your building project. Some one got 40% off. You can log in and check how much you can get. Shoppers Drug Mart's "Spend Your Points Event" is back again. Normally, you can redeem 50,000 Shoppers Optimum points for $85 and redeem 95,000 Shoppers Optimum points for $170. But on Jul 11 & Jul 12, you can get an extra $15/$30 worth of free stuff when you spend your Shoppers Optimum points. Club Carlson is providing a summer promotion called "Get Online and Get Going". You can earn 2,000 bonus Gold Points per night during Eligible Stays at any Carlson Rezidor hotels worldwide before Sep 27, 2015. Note: Online registration is needed. And you need make your reservations on a Carlson Rezidor website or Smartphone App. Another promotion for Visa checkout. This time, it is from Lowe's. You can get $25 discount if you use Visa Checkout as a payment method on lowes.ca for purchases $100 or more before Jul 22, 2015. BTW, you can get extra $10 discount with the Scratch & Save $10 by Jul 15, 2015. So, you can get total $35 discount on lowes.ca before Jul 15. Prime Day is a one-day shopping event of Amazon on July 15, 2015. Amazon says that you will find more deals (including electronics, toys, video games, movies, clothing, patio, lawn and garden, sports and outdoor items and more) than Black Friday. This promotion is for Amazon Prime Members only. If you are not a Prime member, you can try Prime free (30-day trial) and get access to deals on July 15. If you don't want to be a Prime member after 30-day trial, don't forget to cancel it after Jul 15, or Amazon would charge you. To celebrate the TORONTO 2015 Pan Am Games, Esso Extra/Aeroplan members can save 2¢/L on any grade of fuel from Jul 10 to Jul 26, 2015 (Note: this discount is available in-store only). 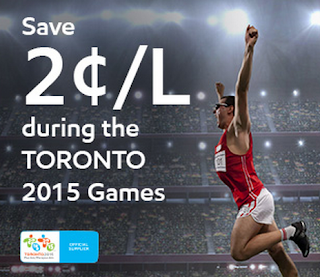 And Esso Extra/Aeroplan can earn 2X points/miles at Esso stations from Aug 7-15. I was told that totally 480,000 Tangerine clients were selected for this offer. Hope you are one of them. You can earn 5,000 SCENE points (5 free Cineplex movies = $60), when you activate or renew a TELUS smartphone on a 2-year Your Choice plan before August 2, 2015. Note: this offer is only available in Ontario and Atlantic Canada. Not available on Prepaid, Business or Corporate accounts. You can choose your $100 Gift Card from Amazon.ca, Starbucks, BestBuy and Ultimate Dining. BTW, besides these previous 3 cards, you can also get $75-$100 gift card when you get approval on Scotia Momentum no-fee/Infinite Visa credit cards through RateSupermarket.ca. Scotiabank is offering 20,000 bonus points when you open a new Gold AmEx card by Oct 31, 2015. The normal welcome bonus is only 15,000 points. With this card, you can get 4 Scotia Rewards points for every $1 you spend at eligible gas stations, grocery stores, on dining and entertainment (4% return for travel redemption). The 20,000 bonus points are awarded when you use your new Scotiabank Gold AmEx Card for at least $500 in the first 3 months. This is not the best offer for this card, because you still need to pay the 1st year annual fee $99. We used to see promotion for this card with 20,000 welcome bonus and FYF. Anyway, 5000 extra points is still better than nothing. Founded in 2011, SHOP.CA allows approved partners to list and sell products on their website for customers to purchase. To celebrate the Canada Day, SHOP.CA is offering 15X Aeroplan miles on all your purchases from Jul 1 to Jul 5. If you don't have a SHOP.CA account, you can use our referral link ( http://www.shop.ca?plcktb=ZwV3XG8CYQ2 ) to register (we can get some bonus). We appreciate you using our links where possible. 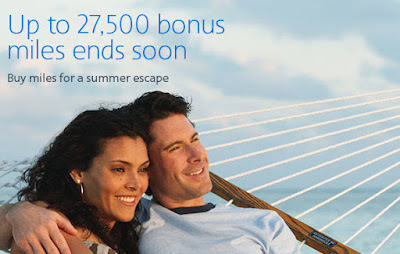 American Airlines is offering a 20% bonus when you transfer from SPG points to AAdvantage miles. 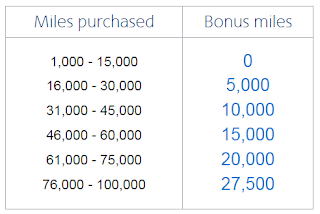 This bonus is on top of the 5,000 bonus SPG gives on a 20,000 point transfer. 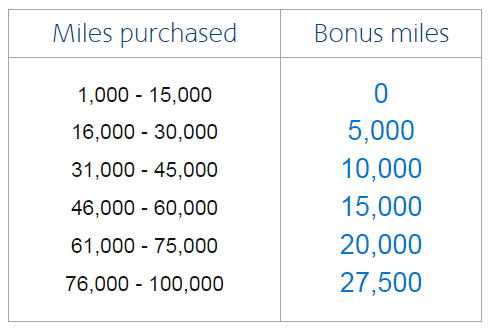 So, you can convert 20,000 SPG into 30,000 AAdvantage miles. Hotwire is a discount online travel agency that offers low prices on airfare, hotel, rental cars, and vacation packages by selling off unsold travel inventory at discounted prices. You can save up to 60% or more on hotel bookings before Jul 6, 2015. This is the summer sale from hotwire.com. Availability is limited and all bookings are final.